260 pages | 11 B/W Illus. Written by an internationally recognized specialist on Buraku studies, this book casts new light on majority-minority relations and the struggle for Buraku liberation. 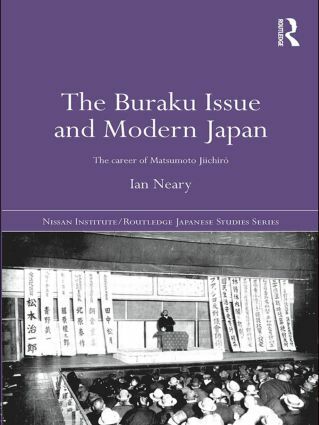 Ian Neary focuses on the Burakumin activist, left-wing politician, family company manager and arguably the most important Buraku leader of the twentieth century: Matsumoto Jiichiro. Based on primary material reflecting recent research, each chapter locates Matsumoto Jiichiro’s experience within the broader developments in Japan's social, political and economic history and illuminates dimensions of its social history during the twentieth century that are frequently left unconsidered. As an examination of Buraku history this book will appeal to scholars and students of Japanese political and economic history, ethnic and racial studies, socialism, social thought and social movements. Ian Neary is a Faculty Fellow at St Antony's College and a Lecturer in the politics of Japan at Oxford University, UK.